Facebook is now competing with YouTube to become the major source of Interesting videos. We all watch lots of videos on Facebook. 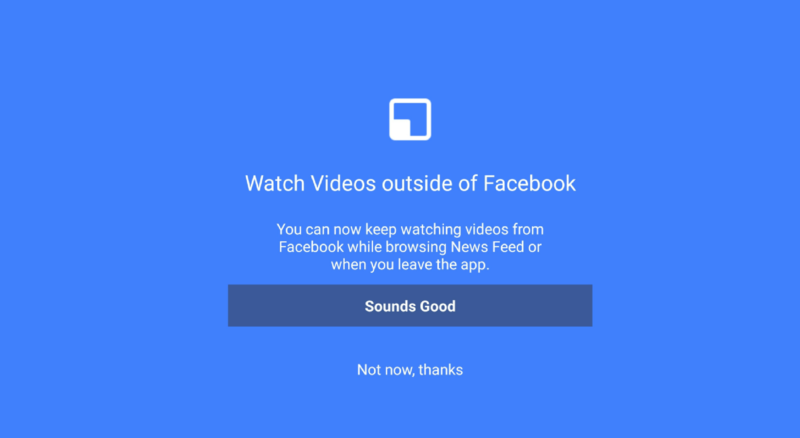 But, the recent change will make videos more interesting on Facebook. Now, you can watch Facebook videos outside of the Facebook app. Yes, you can watch it while scrolling through Instagram feed or searching something on Google. Facebook announced this feature earlier this year in February and now the feature is available globally to all users. Open the Facebook app and scroll down until you find an interesting video to watch. Tap on a video to play and you will see a square icon at the top left side of the video player. Tap on it to start playing the window in a floating window. For the very first time, it will show you a notification where you will get the option to enable the floating video outside of the Facebook app. This video will start playing in a tiny floating window. Now you can even leave the Facebook app. You can switch to any other app, but the Facebook video will keep on playing in a tiny window at a corner of the phone display. You can drag this tiny window to any other corner. This is how you can enjoy Facebook app along with accessing other apps on your Android phone. If your phone’s display is small, you will not find this feature helpful because the floating video window will also be too small to watch the video. You will have clear audio, but the video will be in a very small window. Try this on your Facebook for Android app and do not forget to share your views with us.